We are thrilled to announce that more than $11,000 was raised for conservation at our 2018 Trout Clave on April 21! These proceeds will go to Colorado Trout Unlimited, and will be used to carry out important river conservation and habitat work in Colorado. 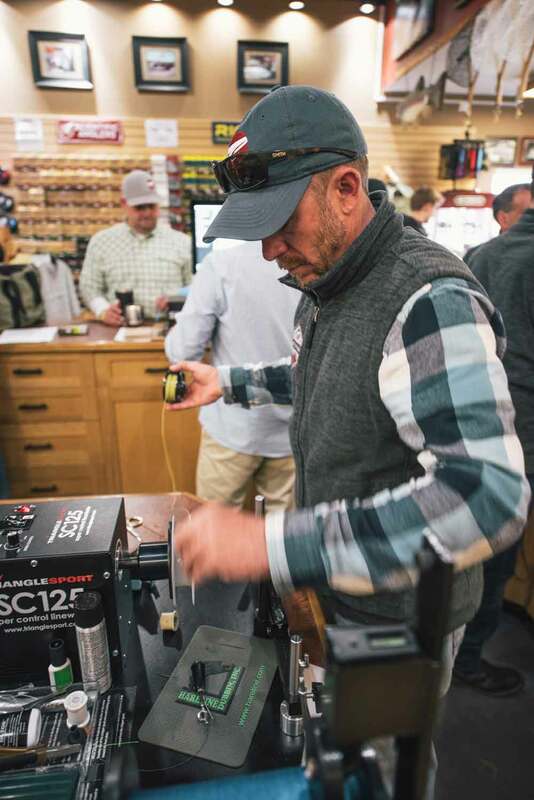 Anglers All and COLORADO TROUT UNLIMITED (CTU) co-hosted this year’s Trout Clave, an annual spring event here at the fly shop. When Anglers All committed to donate a portion of the sales from the event to CTU, Patagonia generously agreed to match that donation. In addition to Patagonia's support, key sponsors for the event included Fishpond, Sage, and Breckenridge Brewery. In addition to raising funds for CTU, the event promoted successful membership drives for the Bonefish and Tarpon Trust and Backcountry Hunters and Anglers. “Colorado Trout Unlimited so appreciated the opportunity to participate in the 2018 Trout Clave,” commented CTU development director, Shannon Kindle. “We had a fantastic day sharing our conservation story with attendees and recruiting a great group of new members! We do owe a huge thanks to our friends, customers and the fly fishing community here in the Denver area. We're extremely proud to be a part of it. Thank you and here's to a great year of fishing ahead! Win a dream trip on the Madison River! 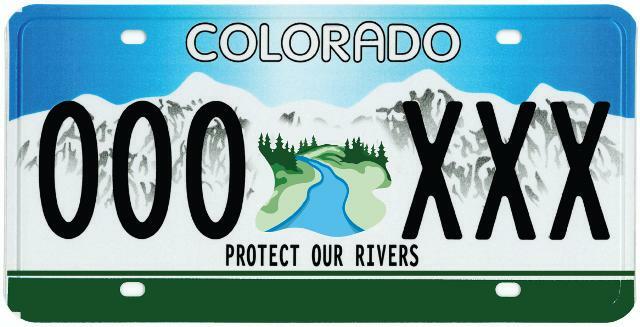 FOR THE COLORADO TROUT UNLIMITED STATE WIDE RAFFLE? This is your chance to win a dream trip on the Madison River – and help your Colorado home waters at the same time! ONLINE TICKET SALES END WEDNESDAY APRIL 25, 2018. ONLINE TICKET SALES END WEDNESDAY APRIL 25, 2018. ONLINE TICKET SALES END WEDNESDAY APRIL 25, 2018. This raffle is conducted under Colorado Raffle License No 2018-12627, and is open only to residents of Colorado. Anglers All 2018 Trout Clave in support of CTU - A Spring Celebration! Spring has never looked so good! Anglers All's favorite annual event is Saturday, April 21 - the 2018 Trout Clave. Join Anglers All and CTU in a celebration of conservation with live music, food, beer, and of course gobs of fly fishing fun. The event kicks off at 9:00 a.m. on Saturday, April 21 and the party will continue until 5:00 p.m. The event was made possible because of great sponsors, including Patagonia, Sage, and Fishpond, this year’s event is going to be one to remember. Be sure to get there early for Anglers All's annual half-off fly sale. From 9:00 a.m. until 11:00 a.m. only, trout flies are 50% off! But the fun doesn’t end there. This year, 10% of all store sales the day of the Clave will be donated to Colorado Trout Unlimited in support of Colorado’s fisheries. Furthermore, Patagonia has generously offered to match this donation to CTU! In addition to Colorado Trout Unlimited, Backcountry Hunters and Anglers and the Bonefish And Tarpon Trust will also be participating in the Trout Clave this year. In fact, anyone who signs up for a membership to one of these great conservation organizations at the Clave will receive a 10% discount on their purchase. Breckenridge Brewery will be supplying cold ones, plus there will be food and live music throughout the day. 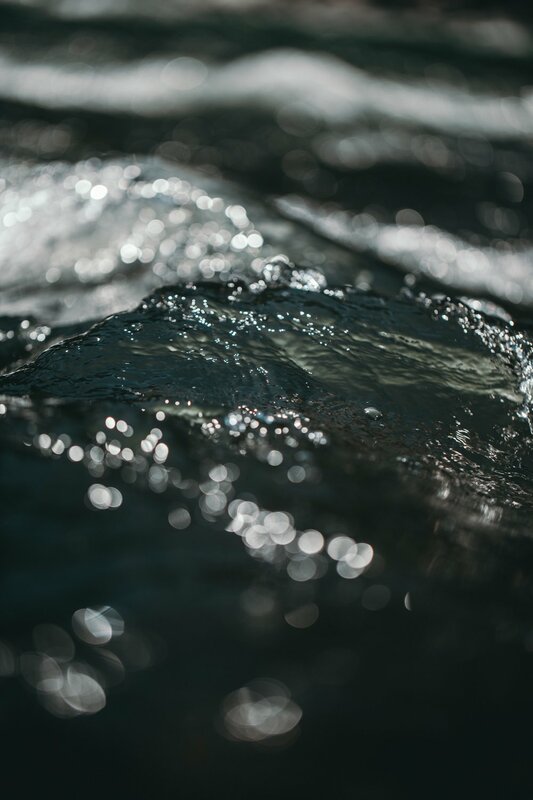 The folks at Breckenridge Brewery will be sponsoring some awesome South Platte River service projects that day, including a river cleanup, pollinator plantings, and installing monofilament-recycling stations along the river. We will be asking for volunteers to signup in advance, so stay tuned for these opportunities. 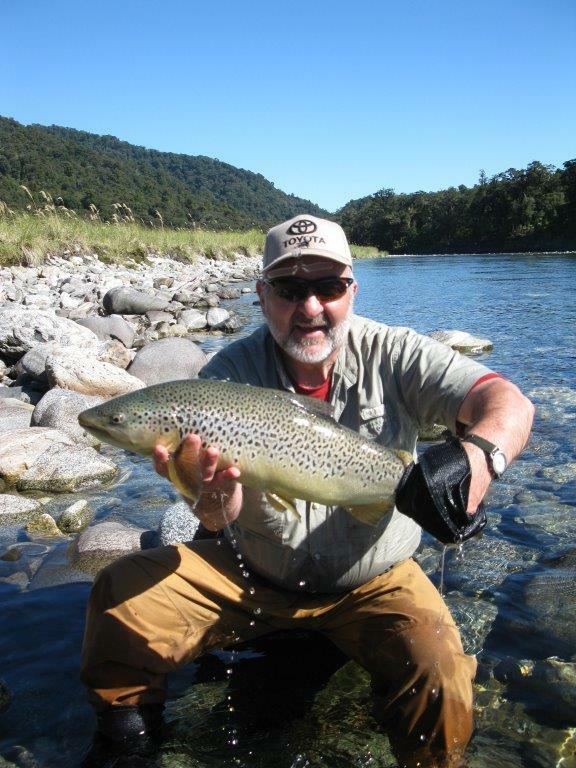 The Trout Clave is a great chance to catch up with friends and customers and to celebrate a new year of fly fishing adventures. There will be raffles, gear giveaways, and opportunities to chat with product reps from some of your favorite fly fishing brands. Big thanks goes to Patagonia for their sponsorship, as well as Fishpond and Sage. We look forward to seeing you at the 2018 Trout Clave! The 2018 River Stewardship Gala Online Auction is Live! 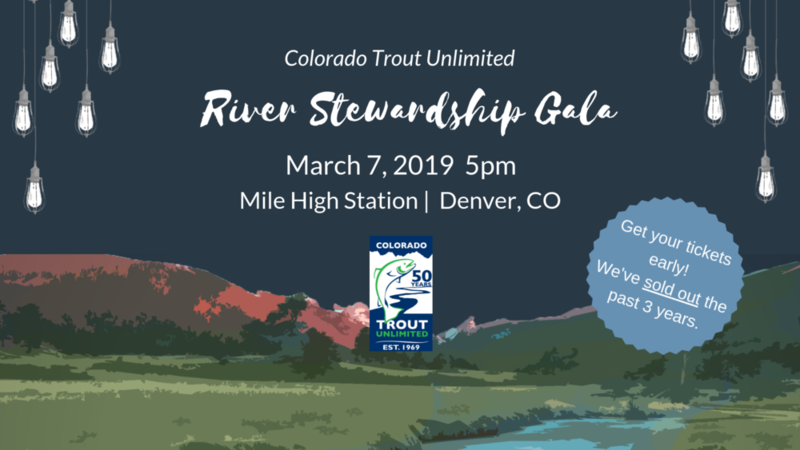 Colorado Trout Unlimited's River Stewardship Gala is this Thursday, March 8! Thanks to our generous donors, we've compiled a massive online silent auction that you can start bidding on right now! When you see an item you like, just click the link to register and you're ready to go. Even if you are not able to make it to the event, you are welcome to participate in our online auction. This is a great opportunity to get some exclusive items, trips, and experiences with proceeds going right into trout and river conservation in Colorado. Pro tip: You can also place reserve bids for items that will be featured in our live auction the night of the event. Click here to see the online auction! The West Denver Trout Unlimited (WDTU) Chapter in Colorado is having their annual "Fantasy Raffle" with proceeds going towards chapter projects and operations such as their annual Joseph’s Journey fishing day for terminally ill children, and several stream habitat improvement projects on Clear Creek. This is a great way to support a local chapter as possibly win a fabulous prize consisting of over 35 great items. The drawing is held at the May Chapter meeting each year. You need not be present to win. This year’s WDTU May Chapter Meeting is on May 2nd. Check out their raffle and purchase tickets! JANUARY 4, 2018 – The National Fish and Wildlife Foundation (NFWF) has recently announced their slate of awardees for the competitive Bring Back the Natives Grant (BBN)– a program that will provide $1 million in grants to support habitat restoration and other on-the-ground projects that advance recovery goals of native fish throughout the United States in 2018-19. A partnership between NFWF, the U.S. Forest Service, U.S. Fish and Wildlife Service, Bureau of Land Management, Bass Pro Shops and the Brunswick Public Foundation, “Bring Back the Natives represents the benefits of coordinated efforts between private landowners and federal agencies to improve the health of watersheds,” said Jeff Trandahl, executive director and CEO, NFWF. As one of the 15 grant recipients, Colorado Parks and Wildlife (CPW) will receive $60,000 to support the design and construction of a critical temporary fish barrier on Cornelius Creek. Located in the US Forest Service Canyon Lakes Ranger District (USFS-CLRD), the George and Cornelius Creek drainage is one of the most significant Greenback Cutthroat recovery sites to date. The Greenback cutthroat trout is currently listed as “Threatened” under the Endangered Species Act, and is believed to have been endemic to coldwater streams and lakes of the South Platte River Basin. Once a thriving species, the Greenback has suffered significant impacts from human development, competition from non-native fish, and the introduction of whirling disease. Once thought to be extinct, the native trout is making a comeback thanks to a coalition of state and federal agencies, non-profits, private landowners, and public volunteers. The George and Cornelius Creek watershed has been identified as a high priority for establishing a robust Greenback cutthroat trout metapopulation. Due to its relatively low elevation compared to that of many other streams in the basin where cutthroat trout reintroduction may be feasible, these creeks feature thermal conditions that fall within an optimal range for cutthroat trout recruitment. Additionally, these streams are already managed for a Greenback cutthroat trout recovery population with regard to the Endangered Species Act, Section 7. Due to the complexity of the habitat within the drainage, Colorado Parks and Wildlife and the US Forest Service will take on the project in stages. With the presence of both whirling disease (WD) and non-native fish in the area, biologists will build three temporary barriers that will segment the two tributaries and allow for effective treatment over the next few years. Once the streams have been cleared of WD and non-native competitors, the Greenbacks will be introduced. This process is expected to take several years. The desired outcome of the entire multi-phase project is successful establishment of a self-sustaining Greenback cutthroat trout population in 14 miles of connected habitat. At this writing, Greenbacks only occur in the wild in four waters, three of which are the result of recent introductions. The Greenback Cutthroat Trout Recovery Plan (US Fish & Wildlife Service 1998), although in the early stages of being updated, calls for—among several other requirements—stable Greenback populations in at least 31 stream miles in order for the species to be considered for de-listing. Currently, there are no stream populations in the South Platte Basin that meet the Recovery Plan’s criteria for “stable conservation populations.” Therefore, the importance of the George and Cornelius Creek Project, which is slated to create up to 14 miles of such habitat, cannot be overstated. The Cornelius Creek barrier is essential to the overall success of the project by enabling CPW biologists to treat the upper section of the creek while concurrent restoration work is being completed in the other units. With the funding provided by the NFWF Bring Back the Natives Grant, CPW will now have the resources necessary to move forward in this critical recovery effort and secure a large drainage for the Greenback. Note: Due to various treatment protocols for Whirling Disease (which has been found in the area), the entire project will likely be completed near 2026. The barriers will be in place by the end of 2019. For more information, please contact Dan Omasta, CTU Grassroots Coordinator (domasta@tu.org). For more information on the NFWF BBN Grant and other recipients, Click Here. Ronnie Crawford first discovered the urban fishery of the South Platte by accident around 15 years ago. He was taking a couple of kids fishing with bait on the river near his house off Evans. Much to his surprise, they started catching trout. That was the simple beginning of a long-term love for fishing the “Denver South Platte,” and for introducing others to all it has to offer. For more than a decade, the Denver Trout Unlimited chapter (DTU), of which Ronnie is a board member, has been working to improve the health of the Denver South Platte – the section of the river starting below Chatfield Reservoir and then flowing through the southern suburbs and downtown Denver. 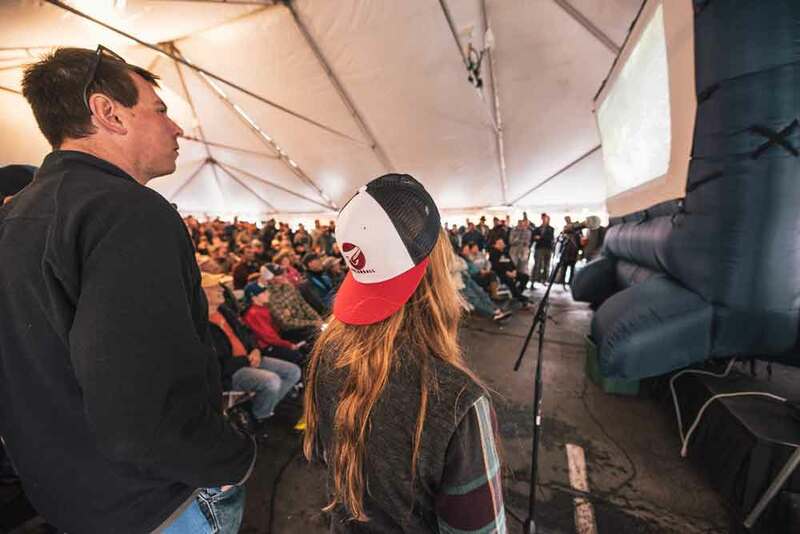 Eleven years ago, the chapter held its first “Carp Slam” fishing tournament, to build awareness of the Denver South Platte and its fishery potential, and to raise funds for river restoration efforts. This year's Carp Slam takes place September 23, with Denver's most awesome after-party taking place atop the DaVita building in LoDo on Saturday evening (purchase your tickets here). As the name suggests, the Carp Slam’s fishing focus is carp—but the goal is to improve habitat in the South Platte for a variety of fish. And many anglers in the Carp Slam routinely catch impressive trout, suggesting the potential for a much more robust urban trout fishery. Restoration work started with the South Suburban Parks and Recreation District in 2012, working to enhance the reach of the South Platte by Carson Nature Center to better support native fish, recreational fishing, and riparian habitat. DTU contributed to the District’s effort with $10,000 raised through the Carp Slam and another $80,000 leveraged through a Colorado Parks and Wildlife Fishing is Fun grant. The restoration effort and partnerships have grown exponentially since then. DTU has worked with the City and County of Denver and the Greenway Foundation on a South Platte Restoration plan that lays out a restoration vision for the river and corridor all along the Denver South Platte. Millions of dollars are flowing toward efforts to improve several miles of river and to create economic benefits from a healthy South Platte as a new recreational centerpiece of the Denver metro area. While appreciating the broader efforts to improve the entire greenway corridor, DTU has helped keep a strong focus on the river habitat itself. “We’re the ones focused on what’s happening below the waterline,” explains DTU member John Davenport. Part of focusing below the waterline has been to pay attention to water quality, including stream temperature. To better document water temperatures and understand the river's fishery potential, DTU purchased and placed in-stream loggers starting in February 2016, collecting hourly water temperature data at six sites along the Denver South Platte. Results to date, Davenport says, look very similar to those for the Arkansas River in Pueblo – a river supporting a popular trout fishery. Eight rivers. Two days. One Rodeo. By David Nickum. In the final weekend of July, I teamed up with Dustin McCory against 29 other teams, all focused on a simple - but surprisingly difficult - challenge: each team member had to catch a fish from out of eight different rivers over two days. Of the 30 teams competing, only 12 completed that challenge. Dustin and I were among the majority that came up short, but we had a great time experiencing some of the best rivers Colorado has to offer. The "8 River Rodeo" was started by Joe Wilson 10 years ago. Its origins came from Joe's experiences fishing with his buddies - one of whom could never seem to drive past a promising-looking section of water without asking them to stop and fish. After several such stops, another friend told him that "fishing with you is like fishing in a rodeo!" And the idea of the 8 River Rodeo was born. Joe offered to organize the event, but only if it was done as a charity fundraiser. 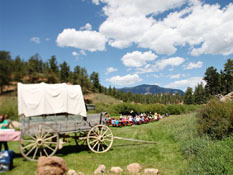 Over the years, proceeds from the Rodeo have gone to support Colorado Trout Unlimited and Project Healing Waters. Now organized by Clint Crookshanks, the Rodeo is held over the final weekend of July. Participants gather on Thursday night in Glenwood Springs to meet up and get their measuring troughs (to document the size of each of the up to 16 fish scored). On Friday, the teams spread out - fishing on public water only - to tackle the first four rivers: the Fryingpan, Roaring Fork, Crystal, and Colorado. 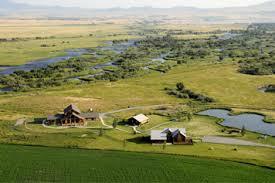 On Saturday, action moves to the Gunnison basin with teams fishing the East, Gunnison, and Taylor Rivers as well as Spring Creek. If an angler misses one of the Friday rivers, they can make it up with the Slate as a fifth Saturday river. I fished in my first Rodeo last year and - beginner's luck - actually completed all eight rivers (albeit by using the Slate on Saturday to make up for missing out on the Fryingpan on Friday). I came in with Dustin this year with a gameplan - which actually matters given the combination of fishing and windshield time (driving between rivers) that you need to manage. We were going to tackle the Fryingpan first thing - head to the "toilet bowl" at dawn - and then work our way down to the Roaring Fork, then the Colorado, and finish on the Crystal as we headed toward Kebler Pass in the evening to be ready for the Gunnison basin on Saturday. We stayed in Basalt and made it to the dam before sunrise. Only to find a line of folks already in place waiting to cast into the pool immediately below the dam. We went a bit downstream, crossed to the opposite side, and fished the far bank. Dustin landed his fish first - not a trophy, but a nice 15" brown trout. We relocated below the bridge where I landed a 12"er and was thus able to record my first Rodeo trout on the Fryingpan. One river down - and not even 9 am. We were flying high! But flyfishing has a way of humbling you, and that was the story of the rest of our Friday. We dropped onto the Roaring Fork just below Basalt. Before too long, I landed an 8" brown trout - I kept fishing in the hopes of picking up something larger, while Dustin continued pursuing his first Roaring Fork fish. To no avail. We headed down to the confluence with the Colorado, where I could cast onto the Colorado while Dustin continued to hit the Roaring Fork - but close enough where we could both get to the other with the measuring trough if we landed something. We struck out there. Crossing the bridge and dropping to the opposite bank, Dustin caught our best fish of the weekend - an 18" whitefish. I continued to get nothing. We moved downriver to West Glenwood where I proceeded to hook and then lose two fish before I could get them to net. Taking a deep breath I patiently tied on another two nymph rig, said a small prayer to the river gods, and tossed my flies into the stream to drift downcurrent and give me tension for making my first cast. WHAM! A 12" rainbow hits the bottom fly before I even have a chance to make that first roll cast. Sometimes luck serves better than skill! With the Colorado behind us, we zipped back up to Carbondale to return to the Roaring Fork - by this time rain was setting in and it was close to 6 pm. We needed to refuel the car, so I offered to grab sandwiches and gas while Dustin kept fishing. Luck was with us as he caught a small but score-able brown trout. We headed up the Crystal towards Redstone, hoping to catch our final fish before darkness fell. But between already high water, further exacerbated by the rain, and rapidly dimming light conditions we gave up on the Crystal and started the drive across Kebler Pass in the darkness, the main excitement coming from avoiding a boulder that had fallen on the road from the rain-softened slopes. Saturday started with high hopes to get fish from five rivers and still complete our rodeo. But the luck that had been with me on the Colorado left me on the Gunnison. Fishing below the town of Gunnison in the morning, I hooked - and lost - a series of three fish. Dustin was also having no luck, so we decided a change of scenery was in order. We headed up to the Taylor River where we found a beautiful pool - complete with a break in the riverside trees to allow for a clear backcast - and both hooked into rising browns to score our Taylor River fish. Four rivers down - four to go. Sadly for me, that was as far as I got - four rivers completed. We went on to Spring Creek, where we fished the first meadow with dry flies. The fish seemed to be taunting us, rising near our flies but never hitting even as we kept trying new patterns and sizes in the hopes of getting the right bug in the right place at the right time. It was not to be, and as afternoon was already rolling along - and rain resuming - we concluded that we wouldn't be completing 8 rivers but we might as well at least FISH them all. So we headed over to the Roaring Judy Hatchery to fish the public reach of the East River there. Fishing around a tree with branches hanging over the river by where the hatchery springs flow out into the East, Dustin landed another brown trout. We swapped rigs, figuring that his set up would give me the best chance to land one as well. Of course, Dustin proceeded to hook another fish on my rod and fly ... another lesson in humility for me. We finished the evening fishing the Gunnison at its source - the confluence of the East and Taylor Rivers - as a light rain continued to fall. While we hadn't succeeded - indeed, hadn't even come particularly close - it had been a great experience to fish together at so many different, beautiful spots in such a short time. We called it a day and headed over to the Almont Resort for dinner. We found out that while we had struggled, the other Colorado TU team - Heather Sees and Niki Cousins from The Greenbacks - had completed all eight rivers (both using the Slate to replace the Crystal, which they like us had missed on Friday). Those well-earned smiles on their faces come with one year's worth of bragging rights - at least until the 2018 Rodeo. Overall, 12 of the 30 teams completed all 8 rivers. For the 10th anniversary year, there was also the option to complete 10 rivers (adding Brush Creek and Cement Creek on Friday and Saturday respectively). Three teams actually completed all 10 rivers - including the overall winners, the Triple Haulin' Nymphers (Dan Lundahl and Earl Hecker), who scored 257.3 inches on the 8 rivers (that's an average fish length of 16 inches!) plus another 51.8 inches on the two bonus rivers. As the evening wound down, Joe Wilson asked if he and his teammate - another Joe - could join us at our cabin if we still had an extra room; they had been camping and with the rain continuing were looking for a warm bed and hot shower. Only when they arrived did I realize that the "other Joe" was none other than author and big-fish guru Joe Butler. We got to enjoy an evening with some great fishing tales from Joe's adventures pursuing big trout in the Great Lakes region - as well as some of his run-ins with the old dry fly purists who did not approve of his use of nymph rigs in such hallowed waters as Montana's Madison River. He also talked about his newest book - "Dangers in the Outdoors" - written after he read about a young couple from the east killed in an above treeline lightning strike in Colorado, and realized that many people could benefit from a little more knowledge about how to enjoy the great outdoors safely. He noted that disease-spreading mosquitoes are the #1 threat and recommended a simple alternative to DEET-laced bug sprays: Bounce dryer sheets. Tucked into your pockets, he said, they work as a great mosquito repellent. The Rodeo wrapped up Sunday morning with all the teams gathering to swap stories, collect awards and raffle prizes, and enjoy a barbeque at the Three Rivers Resort smokehouse. Between registrations for the event and raffle proceeds, Crookshanks expects the 2017 participants to have generated about $4000 to support Project Healing Waters and Colorado Trout Unlimited. What a great weekend, and one we won't soon forget. Want to try your hand at the 2018 Rodeo? You can email Clint Crookshanks at shanks@8riverrodeo.com to be added to his mailing list - registration opens in January.